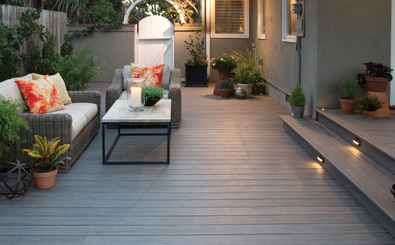 The UK’s Largest Range of Decking Boards! With more than a dozen different styles to choose from, TimberTech’s decking range is easily the largest and the most varied in the UK! No matter what kind of look you’re aiming to achieve in your outdoor space, we can make it happen; our high-quality decking boards can be effortlessly incorporated into practically any design. 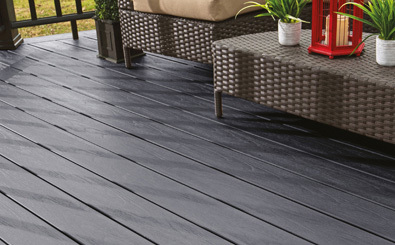 Many of our decking boards come with a flat wood grain that looks just like traditional timber decking. Combine these boards with our composite railing system to create a charming, timeless design that’s perfect for lazy summer days and afternoon tea parties! Looking for something a little more contemporary? No problem – colour options like VertiGrain Grey and Silver Maple allow you to give your garden a style that looks bang up to date yet still appeals to all tastes. Tropical hardwood decking has a spectacularly sumptuous appearance, but it requires quite a lot of upkeep, and it’s not very environmentally-friendly! Fortunately, our range includes a number of tropical-effect deck boards that allow you to get the look of genuine tropical decking without any of the guilt or hard graft. 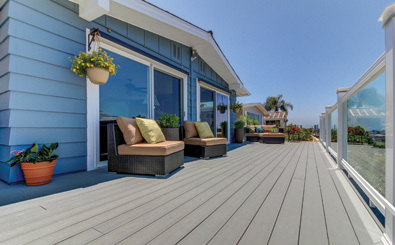 This is just a small sample of what can be achieved with TimberTech’s decking boards. As mentioned above, we have the largest decking range in the UK – click here to see more of our extensive collection, or order a free sample pack to take a closer look!